Startup founders make presentations to seed fund class members, answering their questions as students consider funding decisions. It was a class Bryan Chambers wishes he could have taken in college. 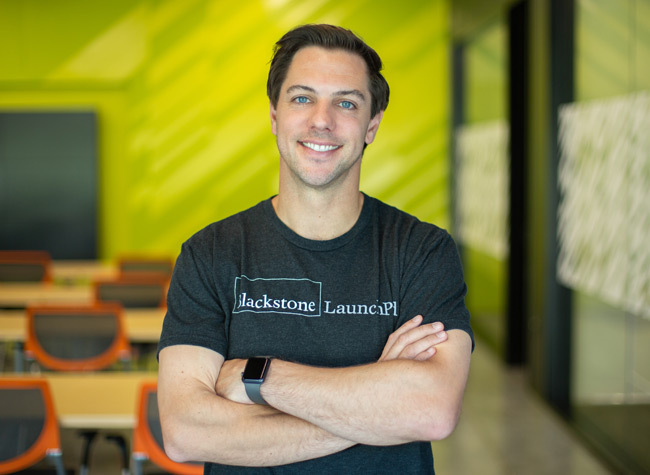 A few years ago, Chambers, director of Blackstone LaunchPad at The University of Texas at Dallas, designed a program that would teach the business of venture capital and entrepreneurial concepts to empower students to invest in technology startups. Chambers was honored with a 2018 Tech Titans award for this work with the UT Dallas Seed Fund. The Investment Catalyst Award recognizes an organization for completing a significant technology-related investment transaction that will impact and deliver significant long-term economic prosperity for the Dallas-Fort Worth area. UT Dallas students enrolled in the Seed Fund Support class, taught by Chambers, work directly with high potential startups on their funding and growth plans, Chambers said. Launched in January 2017, the seed fund invests exclusively in technology startups founded by UT Dallas students, faculty, staff, alumni and other affiliates. Housed under the Institute for Innovation and Entrepreneurship, the program invests in early-stage businesses that have achieved proof of concept, or a prototype, and are ready for commercial product development. Four startups that have received UT Dallas Seed Funds — ShearShare, Fan Guru (formerly Cosmunity), EverThread and Collbox — have raised $5.5 million in total venture funding from a variety of sources. For these startups, this funding comes at a critical time in their lifecycles. Chambers teaches two entrepreneurship classes in the Jindal School. A graduate-level Startup Launch course enables students to launch companies while receiving academic credit and offers mentorship from faculty and local entrepreneurs. Chambers’ “dream class,” Seed Fund Support, is an undergraduate course that enables students to work with startup founders and local venture firms to evaluate the risk and potential of business models and ultimately make a recommendation on which companies should receive financial support. Tina Dimitrova, a senior finance major, participated in the Seed Fund Support course for two semesters, was part of a team that directed $75,000 of fund dollars to two startups. Being in the investor’s seat gives students an immense amount of responsibility and pride, along with an understanding of what it takes to be an entrepreneur, Chambers said. Not everybody has an idea, or a passion, or a reason to start a business, but everybody can get behind someone else’s passion sometimes. Tech Titans, a technology trade association in Texas, represents a quarter of a million employees through its 300 member companies. The nonprofit annually recognizes outstanding technology companies and individuals in North Texas who have made significant contributions to their industries.